Enthusiasm for using Twitter as a source of data in the social sciences extends to measuring the impact of research with Twitter data being a key component in the new altmetrics approach. In this paper, we examine tweets containing links to research articles in the field of dentistry to assess the extent to which tweeting about scientific papers signifies engagement with, attention to, or consumption of scientific literature. 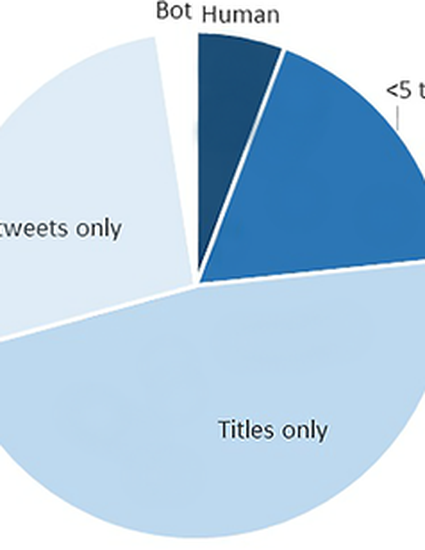 The main goal is to better comprehend the role Twitter plays in scholarly communication and the potential value of tweet counts as traces of broader engagement with scientific literature. In particular, the pattern of tweeting to the top ten most tweeted scientific dental articles and of tweeting by accounts is examined. The ideal that tweeting about scholarly articles represents curating and informing about state-of-the-art appears not to be realized in practice. We see much presumably human tweeting almost entirely mechanical and devoid of original thought, no evidence of conversation, tweets generated by monomania, duplicate tweeting from many accounts under centralized professional management and tweets generated by bots. Some accounts exemplify the ideal, but they represent less than 10% of tweets. Therefore, any conclusions drawn from twitter data is swamped by the mechanical nature of the bulk of tweeting behavior. In light of these results, we discuss the compatibility of Twitter with the research enterprise as well as some of the financial incentives behind these patterns.